Description: A rainbow of bright colors gives your child endless creative possibilities with this set of 14 markers fitted with thin tips at one end and chunky tips at the other. The set also includes one marker that magically changes the colors of your child's drawings and an eraser marker for fixing mistakes or making room for new imaginative art. 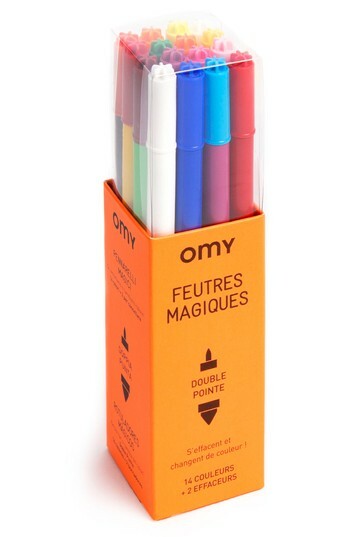 Style Name: Omy Set Of 16 Double-Point Magic Markers. Style Number: 5512094. Available in stores. A rainbow of bright colors gives your child endless creative possibilities with this set of 14 markers fitted with thin tips at one end and chunky tips at the other. The set also includes one marker that magically changes the colors of your child's drawings and an eraser marker for fixing mistakes or making room for new imaginative art. Style Name: Omy Set Of 16 Double-Point Magic Markers. Style Number: 5512094. Available in stores. Enter the details of an online store that carries EAN 3760235518196 below. The store's URL must go to a valid product page that has the product displayed with pricing information.